In the annals of credible public pronouncements, it ranks somewhere between Colin Powell’s United Nations speech on Iraqi weapons of mass destruction and anything emitting from Donald Trump’s mouth. 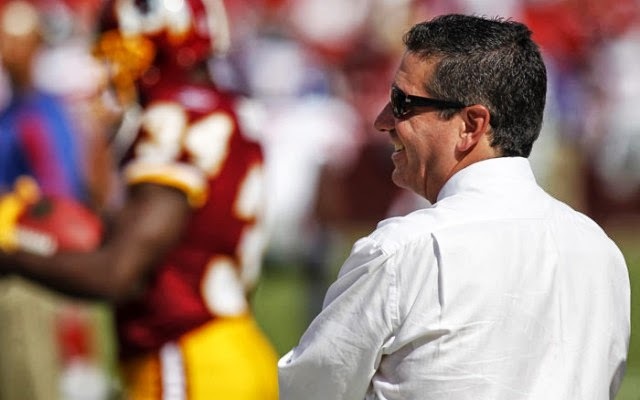 Washington Redskins owner Daniel Snyder told USA TODAY Sports this week that he will never, never, NEVER change the club’s nickname — note: the all-caps were Snyder’s suggestion — even if the franchise loses an ongoing federal trademark lawsuit. Look, I get that Snyder is a local boy made good, had a team belt buckle as a kid, wants to HONOR the PROUD tradition — you know what? All-caps is contagious – of Sonny and Sam and Gibbs I and Albert Haynesworth’s shuttle cones and unsold Bruce Smith “Sack King” T-shirts and throwing footballs over great distances, yadda yadda yadda. I also understand that Snyder, like many people, doesn’t find the team’s nickname personally offensive, demeaning or just plain racist — after all, it’s not an anti-Semetic newspaper doodle or anything – and couldn’t care less about people who do, with the sole exception of not calling those people “Redskin” to their faces. Experts estimate that the costs of changing an NFL team’s nickname — from legal work to revamping stadium signs to redrawing the pixels in “Madden NFL” – could run as high as $20 million. Trademark lawyers are expensive, too, but for now, it’s much cheaper for Snyder to fight the nickname case in court, the better to financially keep on keepin’ on. Should the club lose the case, however, that equation will change. How so? Selling “Redskins” gear no longer will be the exclusive domain of the team. Anyone will be able to print T-shirts, sweatshirts and flags and sell them with impunity. There’s simply no way — NO WAY — Snyder will stand for that. After all, the Washington owner is a man who tried to sell an “official mattress” of Six Flags, $20 Redskins-branded lottery tickets and $30 Redskins-themed Cleatus the Fox Football Robot dolls (price on Fox Sports’ website? $23.96); who once sold fans out-of-date peanuts from a bankrupt airline; who once forced a local broadcaster to deliver news from a parking lot because his station wouldn’t pay to become an official “media partner” of the team; who has successfully been sued by a former nanny and team employees for underpayment; who once charged fans for access to training camp, and also for parking to attend said camp; and who once charged fans $25 to park on … Fan Appreciation Day. Snyder may truly treasure his club’s retrograde nickname, but all available evidence indicates he treasures his bottom line a lot more.